The world is drowning in debt—$152 trillion, or 225 percent of the world’s GDP, according to the International Monetary Fund. 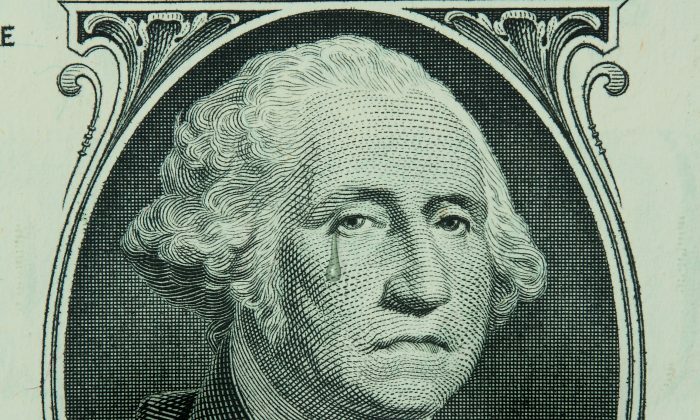 In the United States, total debt (including government and private) exceeds $62.5 trillion, or 334 percent of GDP, according to current Federal Reserve data—that’s $196,000 for every man, woman, and child in this country. Debt itself isn’t a problem, if it’s spent and invested wisely. But rising debt-to-GDP ratios mean the debt hasn’t led to increases in output, so it cannot be paid down. If debt is not productive, it constrains economic activity, which is one of the reasons the recovery since the Great Recession has been the weakest on record. Historically, debt levels of this magnitude have never been paid back in real terms. They were reduced through default or inflation, with sometimes devastating results. This time around, however, creative economists say there are ways to reduce the debt burden without disrupting the economy too much. He said the creation of new debt is one of the major sources of demand and is mostly responsible for the period of almost uninterrupted economic growth from 1980 to 2008. But private households and businesses—let’s leave the government for later—cannot take on infinite amounts of debt because they have to generate the cash flow to pay interest. And they actually have to pay back. From the borrower’s perspective, there is a limit to how much money he wants to use for interest payments. Most people also don’t want their credit scores impaired or want to go bankrupt, putting another limit on private household debt. In fact, households are still struggling with the housing debacle of 2008. As of the first quarter of 2016, 12.7 percent of homeowners owed more than their house was worth, according to the research firm Zillow. Mortgages make up $9.7 trillion of the $14.6 trillion in household debt as of the third quarter of 2016. From a lender’s perspective, if there is too much debt and insufficient capital, even small losses could lead to bankruptcy. Also, regulation is piling up, making lending to the productive economy more and more difficult. These naturally imposed limits are much higher than they were historically and are at extreme levels because of previous deregulation and reckless central bank policies, but there is a limit nonetheless. Another issue is how today’s private debt is structured: Most of it stems from the financial sector and is used for speculation rather than productive purposes. Total financial sector debt currently makes up $15.6 trillion of the $62.5 trillion total, which consists of government debt, households, private financial companies, and private non-financial companies. Not only is this financialization of the economy not productive, it is also dangerous and one of the main causes of financial crises like that in 2008. 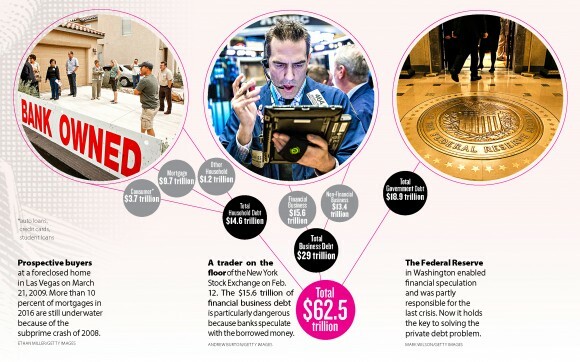 Financial players use a little capital and a lot of debt to increase profits on their trades. So even small losses on big positions force them to unwind the trade and repay the debt. In the worst-case scenario, this can spread to other sectors of finance and eventually the real economy. “Because there are so many leveraged positions, only a few have to go bad and you get leveraged losses. You have to liquidate good assets to cover losses on bad assets and that’s when you get a contagion effect, like in 2008,” said Nolt. When most people talk about debt, they talk about the U.S. national debt, which is approaching $19 trillion, more than 100 percent of GDP. However, this debt is not a problem at the moment because of the way the government is set up. Unlike households and businesses, the U.S. government can force people to give it money to service its debt via taxation. Also unlike households and businesses, the U.S. government can coax the Fed into buying its debt at artificially low rates. “Public debt is not nearly as volatile as the private debt. As long as you can squeeze the public, you don’t go bankrupt. The United States has never defaulted on its debt. If you have the taxation ability, the debt can be a problem if it’s squeezing the budget, but it won’t spark a crisis,” said Nolt. The government can roll over the debt using the Fed via expanded quantitative easing programs (under which the government creates money to buy securities from private banks); it merely needs to worry about paying investors, excluding the Fed, the interest on the bonds—around $250 billion per year. Net interest expense is a much smaller budget item than Medicare and Medicaid ($1.1 trillion) or social security ($916 billion). “Japan is the poster child for this currently. Its government debt is 230 percent of GDP. It does not create the financial crisis that private debt does,” said Vague. Also, regulations force people to keep using the dollar (or yen), even if they know the Fed (or Bank of Japan) is debasing the currency by monetizing government debt. “The system has become very good at luring people into debt. And when you’re a debtor you must earn dollars to service your debt, or else the creditors will take the asset,” said Keith Weiner president of the Gold Standard Institute, a think tank. Ditto for tax liabilities: You have to use dollars to extinguish them. This procedure doesn’t work for countries like Greece, which doesn’t control its own central bank, or the Argentina of 2000, which had its own central bank but had to borrow dollars to finance its trade deficits. The United States has a large trade deficit, but it is still borrowing in its domestic currency because the U.S. dollar is the world’s reserve currency. 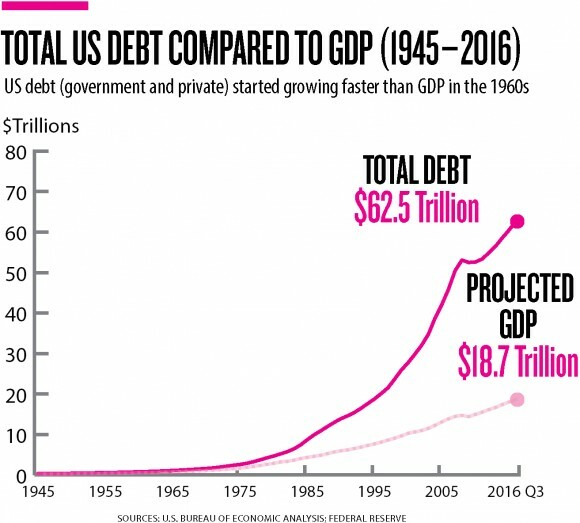 If the U.S. government keeps printing and wasting money, eventually something will have to give, but for the time being, at 101 percent of GDP, the government debt is not a big drag on the economy. Don’t think it will ever go to zero—this debt cannot be repaid in real terms. In an ideal situation, the financial system would not rely on so much private debt to generate growth and would keep debt levels from spiraling out of control. Historically, the economy had a self-regulating mechanism that worked pretty well. “In the ancient world, you couldn’t default because you would upset the natural order of things. That’s why [being sentenced to] slavery was the consequence of default. Even the United States had debtors’ prison until the 1830s,” said Dan Oliver, principal at hedge fund Myrmikan Capital. “Society was set up in a way to cope with it,” Keen said. “It was an existential threat to the country to let the debt get out of control.” To prevent everyone from becoming a slave, there were periods of debt forgiveness or debt jubilees, another incentive for lenders to not lend too much. After the formation of the limited liability corporation, the abolition of debt slavery, and the standardization of bankruptcy procedures, capitalism advanced, according to Oliver. “It encouraged risk-taking by entrepreneurs and forced the lenders to assess the value of projects,” to make sure borrowers would be able to repay them, he said. However, this system only works if there is a limit on the amount of debt that banks and other financial actors can push into the system, as under a gold standard. If not, the incentive is for lenders to lend ever more, hoping to get bailed out if a crisis hits. “Once the creditor class took over and prevented the debt-jubilees from happening, debt got out of control,” said Keen. But what to do if levels are already out of control? There are only two ways to wipe out debt if it cannot be repaid by increases in output. The worst for the economy, even though it may be the fairest, is bankruptcy and debt deflation or destruction. A company or an individual—and sometimes a government—just says it can’t repay its debt. The lender takes control of the assets, if there are any, and tries to recover as much of the loan as possible, making up for the shortfall with its capital provision. This is exactly what happened during the Great Depression, when companies and individuals defaulted in droves, driving thousands of banks into bankruptcy as well. “If you borrowed money to buy a house or a machine, you couldn’t repay the debt, no matter how productive you were. Deflation penalized producers who misjudged the value of their assets at the time,” said Oliver. Private debt declined 20 percent from 1930 to 1933 but GDP declined 38 percent, so the debt-to-GDP ratio actually increased from 175 to 225 percent, according to data from Debt Economics. “Deflation can increase the level of private debt to GDP, because GDP falls faster than private debt. Paying down the debt, withdrawing money from circulation and reducing its velocity, reduces GDP more than the decline in the debt,” said Keen. So this exercise is best avoided, which is precisely what central banks did during the 2008 crisis with their QE programs and bank bailouts. 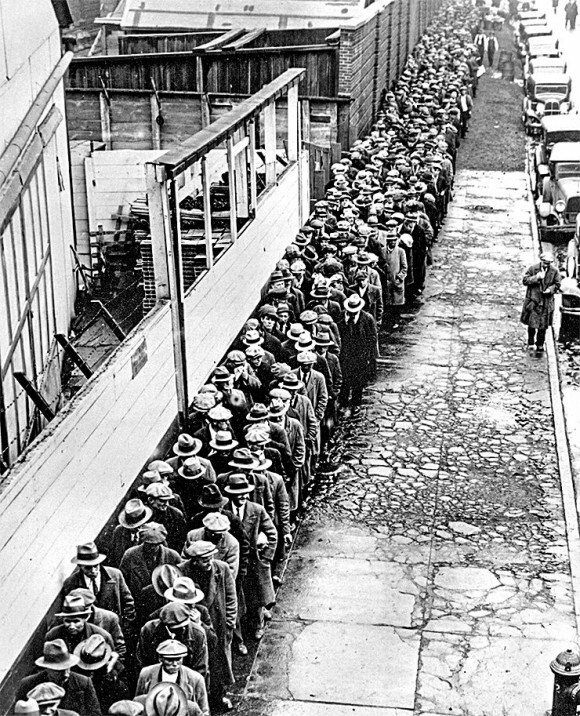 They managed to avoid a second Great Depression, but they didn’t get rid of the private debt. Despite the evident flaws in a system that has provided incentives for borrowers and lenders to indulge in too much debt for their own good, there are creative ways to reset the system and at least get the economy growing again. “Every debt collapse in history has had a combination of debt forgiveness and inflation. That is how debt problems are dealt with historically,” said Oliver. Western central banks have tried to create inflation through their QE programs but weren’t successful because of deflationary pressures: overcapacity in China, technological innovation, and the fact that their money printing ended up in the hands of financial actors, who bought a lot of stocks, rather than real people, who would repay debt and buy goods and services. “The creative way to get around it, is use the government’s capacity to create money. You use the same power the central banks did with QE but pay it into private sector accounts rather than commercial bank accounts. Households and companies can use it to pay down debt and those who don’t have debt, can get a cash injection,” he said. So this means government debt will go up, but as discussed earlier, this is not a problem if the Fed buys 100-year bonds or perpetual bonds with little or no interest. Then it wouldn’t be debt to be repaid and serviced but just an accounting entry at the Fed. President-elect Donald Trump’s deficit-funded tax cuts, and his infrastructure program, would serve these purposes, and some members of his transition team have already put on the table the concept of longer maturity bonds. “It can be inflationary, and it’s a question of how much inflation you want. But it’s only inflationary if there is enough demand,” said Keen. Private sector debt would decline through direct paybacks and inflation. After households and firms have found their desired level of debt, the re-leveraging process can begin again, and the economy can grow again. Of course, this doesn’t mean that the process is without cost. The buildup in private debt that didn’t lead to increases in productivity (suburban houses, for example) represents wasted capital that the economy will never be able to get back. However, the process of paying back the debt without wrecking the economy requires recognition of that problem and the willingness to move on. But haven’t all episodes of deficit monetization led to hyperinflation, like in Weimar Germany, Zimbabwe, or Venezuela? Not necessarily, said Keen. So if the money is spent to reduce private debt and for productive investment, the inflationary effects could be benign and manageable. What about debt forgiveness? Rather than a blanket debt jubilee, Vague has a plan on how banks can forgive debt without going bankrupt. Instead of carrying underwater mortgages on their balance sheets for ages and thereby constraining new lending, banks could have written down the subprime loans to market value at the time of the crisis, freeing consumers from excess debt. Instead of taking the loss out of their capital in year one, however, like in the Great Depression, the regulator could have allowed banks to write down the loss over several years. So instead of going bankrupt because everybody is selling at the same time and asset values are depressed, this would allow the market to clear and would leave the banking system intact. During most panics, like the 1929 stock market crash or the 2008 housing crash, prices tend to overshoot to the downside because of forced liquidations. After the market clears, prices usually recover. On the flip side, if the individual sells the house at a profit because the market has recovered, they would have to give up most of their gain because their loan was written down in the first place. “It’s a specialized debt for equity exchange. You could do that to other types of loans as well,” said Vague. The financial system based on bank debt is flawed. However, ideas such as quantitative easing for the private sector or allowing banks to write down their losses over several years hold promise for freeing the economy from debtors’ prison.